More and more research has been coming out recently on how much carbon is being sequestered and thus stored in different ecosystems. Mangrove forests are one of the most promising biosequesters, having the highest carbon net productivity among all ecosystems. By capturing carbon dioxide and storing it in their biomass, mangrove species are able to reduce the amount of excess carbon in the air, thereby lessening the greenhouse gas’ contribution to global warming. 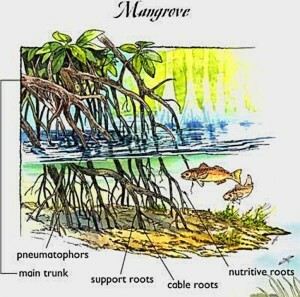 Mangroves are especially suited for carbon capture because they pile most of their carbon on the ocean floor, while terrestrial forests keep most of it in trees and branches. 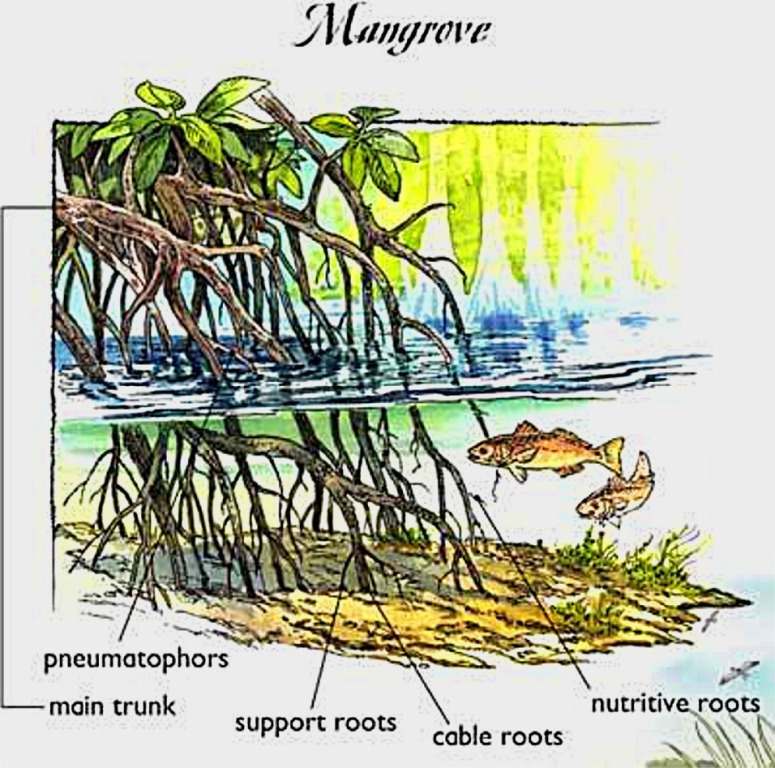 Coastal marine environments like mangroves and seagrass meadows capture carbon from the air and use their long root systems to bury it deep within the soil. Coastal ecosystems keep sequestering large amounts of carbon throughout their life cycle. Coastal vegetation usually spreads deeper below ground than it grows above with some plants going as deep as eight meters. Rather than the plants, the majority of carbon stays locked away in the sediment below them where it can stay for centuries or even millennia, so only a relatively small amount is released when the plant dies. It is estimated that coastal habitats store up to 50 times more carbon in their soils by area than tropical forests, and ten more than temperate forests too. It is believed that even these remarkable figures may be underestimations, since the accumulation rates do not take into account tidal pumps that move carbon from coastal environments into the open ocean. Only a few studies have yet determined just how much of an affect these tidal pumps have on the carbon cycle. This immense carbon sequestration capacity of these coastal habitats has been almost completely ignored and may also be a vital component in global efforts to mitigate climate change. The estimated yearly net rates of Carbon Sequestration (primary production minus loss through plant respiration, litter fall, root turnover and exudation of organic compounds) range from 1.14 t/ha to 1.5 t/ha to figures even approaching 3-4 tons. For this project, we assume that one hectare of Mangal will sequester one metric ton of Carbon every year. This is a highly conservative figure that takes into consideration that re-planted Mangroves will only develop their full capacity to sequester Carbon after several years of growth.